Last week had reported about a new Android-powered Nokia smartphone has been spotted on the GeekBench website. Not much was revealed by the smartphone itself, but it was good to know that people might finally be getting a Nokia smartphone after all. Although the device is not going to be anything close to a flagship smartphone. We saw that the device was powered by a mid-ranged Snapdragon 430 SoC and had 3GB of RAM. And now we have more reports claiming the same. The device has been spotted yet again on Antutu, which is yet another benchmarking website. 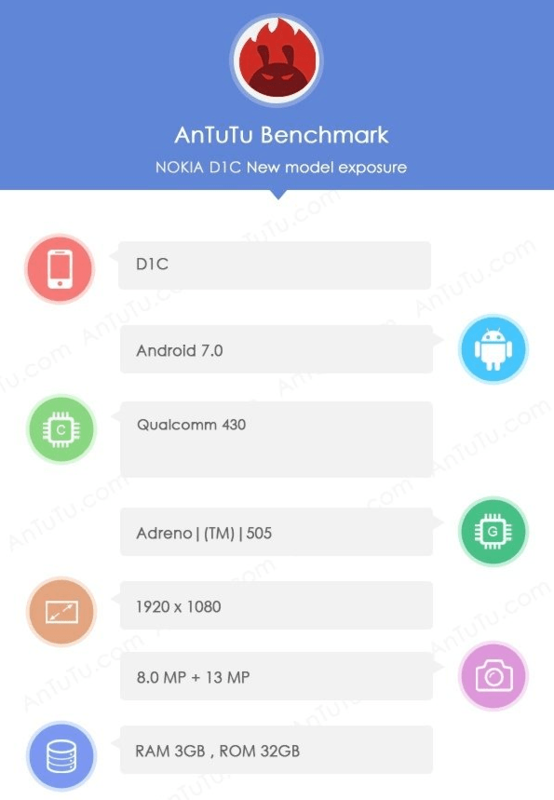 According to the benchmark listing, the smartphone has listed as Nokia D1C again which is same as that of last time. It is powered by a Qualcomm Snapdragon 430 SoC and also packs Adreno 505 for graphics processing. It looks like it will sport an FHD display on the front, however, no info about the display size is mentioned. The device packs 3GB of RAM along with 32GB of internal storage. In terms of the camera, we are looking at an 8-megapixel front facing camera and a 13-megapixel rear facing camera. It is also mentioned to be running the latest Android 7.0 nougat out of the box, which is a good thing to know since most of the new devices are skipping this for the 6.0 Marshmallow only. And this is all the info we have right now as far as the specs of this new smartphone from Nokia is concerned. Stay tuned for more info on this device in the future. Earlier – Everyday, we come across a bunch of smartphones in benchmarking websites. Not all of them are worth mentioning or taking a look at. But when you have something from a company which is trying to enter the smartphone market again, we certainly can’t ignore those. The company we are talking about here is none other than Nokia. Although this is not the first time that we are looking at a smartphone leak from Nokia in a long time, but this we time we have a couple of specs as well. This is pretty much the first concrete info we have on the device till now. This smartphone is listed by the name of Nokia D1C and it looks like it is going to be a smartphone powered by Android. It is finally good to see a smartphone powered by Android after a long wait. Well, it is not a bummer that Nokia is making an entry into the smartphone market yet again. We previously reported about the same, where the company signed a strategic licensing agreement with Finland-based HMD Global for manufacturing Android powered Smartphones and Tablets under the brand name of Nokia. Now keeping all that aside, let’s see what we are going to get here. As mentioned earlier, the smartphone is listed as Nokia D1C. It looks like it will be powered by the latest and greatest Android 7.0 Nougat out of the box. This is a good move since this is a comeback, they might as well put the best one out there. The device is powered by a Qualcomm Snapdragon 430 processor which carries the model number MSM8937. This is an octa-core processor based on the ARM Cortex-A53 architecture and has a clock speed of 1.4 GHz. The processor is also complemented by an Adreno 505 GPU for graphics rendering. In terms of RAM, we are looking at 3GB of memory, which should be enough to day-to-day activities. Well, that’s all the info which we have as of now regarding the device. We are still more confirmation on the specs like display size, battery capacity, camera details, etc. However, since the Snapdragon 430 is capable of supporting displays not more than FHD, we are expecting the device to come with only an FHD display and QuadHD. However, it is not confirmed yet and these are just initial set of speculations. Previously it was reported that the company will be launching two new smartphones with 2K displays in China. It was reported that one will have a 5.2-inch display and the other will sport a 5.5-inch display. Both the smartphone were quite promising as far as the specs were concerned. But now we have these new set of config so it is quite unclear at this point on what to expect. We suggest you to wait for more info on this device, as we should be getting more info in coming months. Stay tuned for more info.